Home Warranty Deductibles. / Service Fees Do They Matter? At what cost? Do Deductibles Matter for Home Warranties? 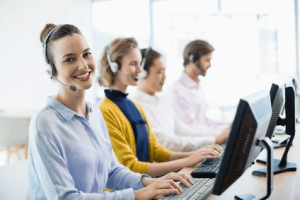 Home warranty deductible, or service call fees, is an important concept to master if you want to understand how to find the cheapest home warranty plans for your needs. When you are trying to figure out whether a home warranty is “worth it”, because these deductible fees can add up to substantial amounts that will have a strong impact on the value/risk equation, together with the actual home warranty coverage provided. Before we delve further into home warranty costs and compare the deductible fees on a per company basis, it is highly important to mention that choosing the best home warranty company goes above and beyond the costs. A homeowner cannot benefit from a home warranty that doesn’t provide good coverage, has low limits and/or doesn’t provide good support for its clients. If the customer support is unreachable throughout the day, the actual cost of deductible becomes insignificant! The idea of a home warranty is exceptional hassle-free service, which can save you both time and money. There are a lot more variables involved in determining that. If you want to see our thorough analysis of various companies you can view this list of all providers we have reviewed to date. If you’ve ever bought insurance, you might be familiar with the general concept of a deductible. When something goes wrong, the deductible is what you have to pay before the insurance kicks in. With home warranties, the concept is similar. Most home warranties have deductibles, sometimes known as service fees. When you call in for service using your home warranty, you will need to pay this fee in order to receive service. In other words, the service call fees are the home warranty deductibles. For example, Choice home warranty deductible is Choice home warranty service call fee, Select home warranty deductible is Select home warranty service call fee. In American Home Shield review you can find that American Home Shield service fee is the cost of a service call. There are home warranty companies with no deductibles. It should be noted that while the vast majority of home warranty plans have a deductible, some do not and they don’t charge a service call fee. These are not specifically included in our survey because they are fewer in number, and less likely to be encountered by consumers. Most of the home warranties do have deductibles or service call fees with an industry average of approximately $75 per. Some companies, like American Home Shield or TotalProtect Home Warranty, let their customers choose the amount of a deductible, which depends on the amount of premium. The higher the premium, the lower the deductible. For more detailed information on deductibles in different companies, please see the table below. It is important to pay attention to the coverage limits on any plan. Maximum limits which are very low render the plans largely ineffectual. This study considered plans with deductibles and reasonably high compensation limits, and the potential to compensate for major repairs. That is, after all, the main reason why so many opt for a home warranty policy in the first place. How Much Are Home Warranty Deductibles, and How Do They Affect Premiums? We surveyed 86 home warranty policies from 20 different companies to discover what consumers can expect to pay for deductibles. We found that home warranty deductibles range from $50 to $125 for these major policies, with 42 of the policies, about half, at $75. A smaller number are higher at $100 (16) and the highest figure of $125 (7). 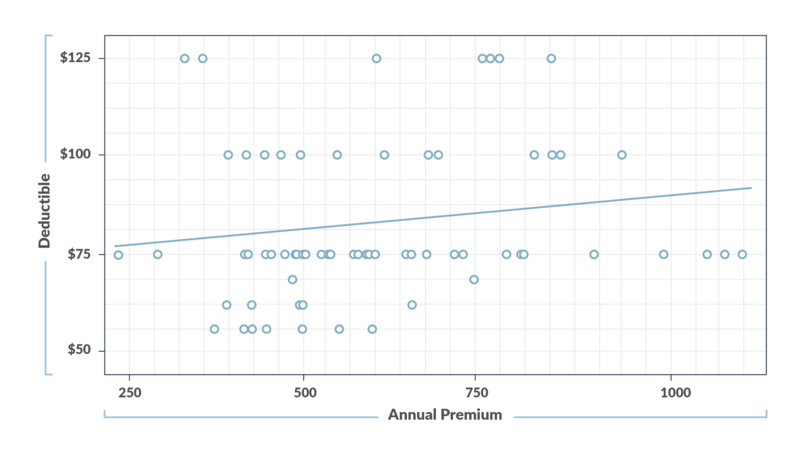 For premiums, we found a range from $240 annually to just over $1100. It might make sense that a higher premium would result in a lower deductible, right? This is not the case. In fact, some of the highest premiums have slightly higher deductibles and service fees. At first glance, this may seem to confuse the situation further. How do you decide which plan to buy when premiums and deductibles have a minimal relationship? In fact, however, knowing up front that premiums and deductibles are not proportionate in any regular sense frees you to make a choice based not only on price, but on coverage. You want to buy a plan you can afford to pay the premium and deductibles on, of course, but beyond that to ensure that you are covered for all potential issues in your home. 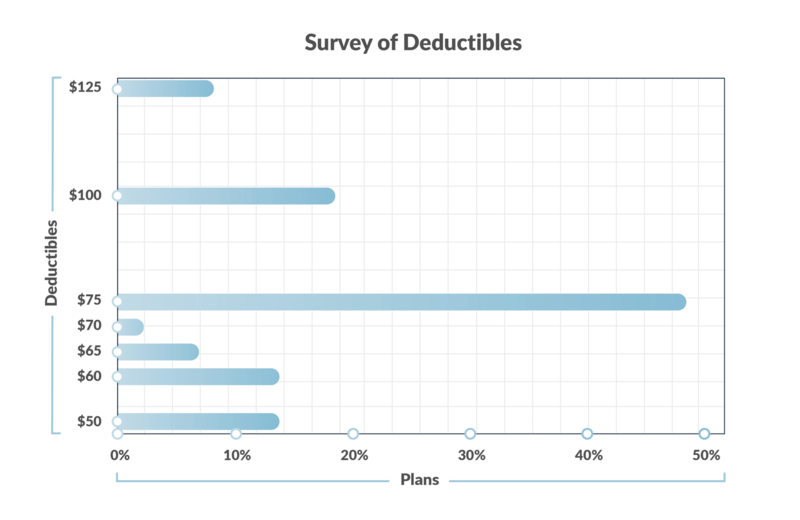 What Are Common Issues Reported Relating to Deductibles? 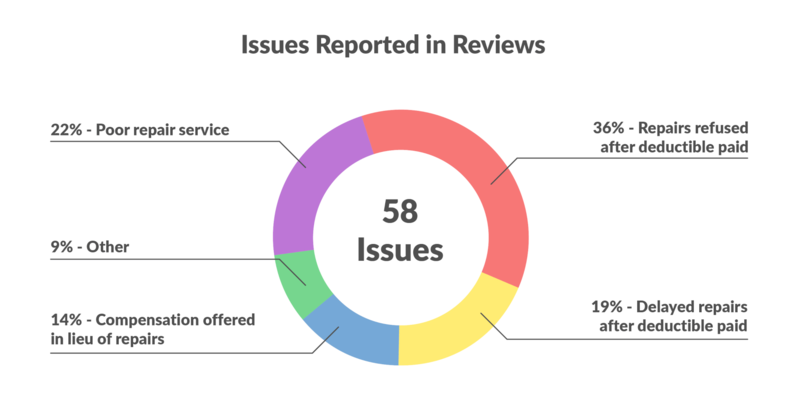 In order to discover the most common issues reported relating to home warranty deductibles, we surveyed 443 online comments and reviews relating to home warranty companies and found 58 which mentioned the deductible. Reviews mentioned a wide array of issues for which coverage was invoked, including air conditioners, ovens, water heaters, and refrigerators. It’s important to note that a good home warranty will cover all of these and many other potential problems within the home. Why, then, were deductibles mentioned in these reviews? 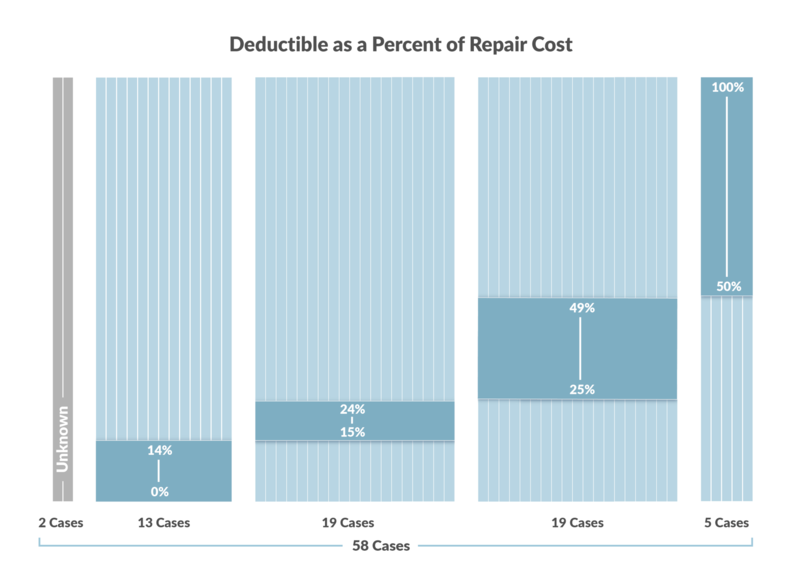 The majority of issues related to either the refusal to repair an issue after a deductible was paid (36 percent) or a delay in repairs after the deductible was paid (19 percent). This indicates that many problems relate directly to obtaining repair service after the deductible is paid. A smaller number of consumers (22 percent) reported that repairs were done, but that the repair service was poor. Then, 14 percent mentioned that compensation was offered in lieu of repairs, and 9 percent mentioned other issues. Some consumers also complained that they paid a deductible several times for several visits on the same issue. Finally, it’s important to consider the value of the deductible as a portion of the overall repair cost. In order to do make this calculation, let’s consider a hypothetical scenario in which all reviewers actually had repairs completed. If such were the case, what value would the deductible have represented? Out of the 58 reviews surveyed, 13 paid less than 15 percent of overall repair cost as deductible, and 19 paid either 15 to 24 percent of the repair cost or 25 to 49 percent of the repair cost. The value of repairs far exceeds the value of deductibles, especially when the repairs being sought are very expensive. In any given case, the ultimate value proposition depends upon the severity of the repairs. The more severe the repairs, the better value is the deductible by comparison, and the more money saved for the homeowner. Consumers ought to be cautious in ensuring that repair service will be rendered by their home warranty provider in a fashion that addresses the issue head-on, in a timely fashion. With proper research, however, consumers are empowered to decide which companies are likely to provide better service, and which are not. Ultimately, the decision about buying a home warranty is one that only you can make based on your own parameters and priorities. Home warranties with deductibles offer the greatest range of options for ensuring proper coverage for common household issues, despite the service call fees. As discovered by this survey, however, premium and deductible costs ought not be the sole determining factor in purchasing a home warranty. Sift through plans based on what you can afford, and then, on what best meets your needs. The quality of a home warranty plan should be on the mind of every homeowner looking to invest in a home warranty. Keeping the issues in this article in mind will help to give context to that decision. ii Review data sourced from www.mythrecents.com and www.outscam.com.